I’ve been looking at a lot of “Clean Eating” meal plans, grocery guides and recipes… I’m really intrigued. Cutting out all processed foods would be really beneficial, but also very challenging! I think after depriving myself of certain foods for a while, I would be cranky and end up giving in. Even simple things like coffee creamer, granola bars, and bottled salad dressing would be hard to avoid. Without committing to the eating plan fully, there are plenty of replacements anyone can make to clean up their diet. Some of these alternate snack choices aren’t necessarily lower calorie, but they either have significantly less sugar, fat or sodium or they just have a much-reduced amount of artificial add-ins or funky chemicals. 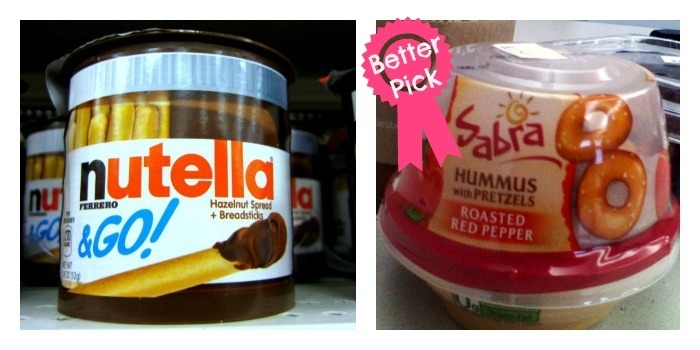 I feel a little left out of the Nutella bandwagon…. I have no idea how the spread got so popular but last week I read on article about a Columbia University student stealing over $5,000 worth of the chocolate treat from the school cafeteria in a week??? What does one person do with that much Nutella! It is equal parts impressive and repulsive. 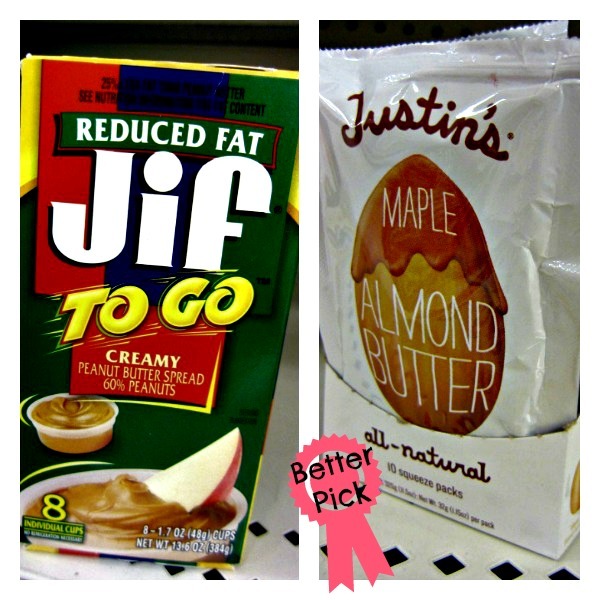 As for me, I’d rather just go straight for some good ole’ peanut butter. These Nutella Snack Packs are practically HALF SUGAR. Sugar, the first ingredient, makes up 23 of the 52 grams in the container. The breadsticks and chocolate cream add little to no nutritional value to your snack. Sabra Hummus and Pretzel Thin Cups. For about the same amount of calories, this snack contains just one gram of sugar. It’s first ingredient is chickpeas, which are packed with protein and fiber. It’s super low in saturated fats, sodium and cholesterol. The Roasted Red Pepper is my favorite! 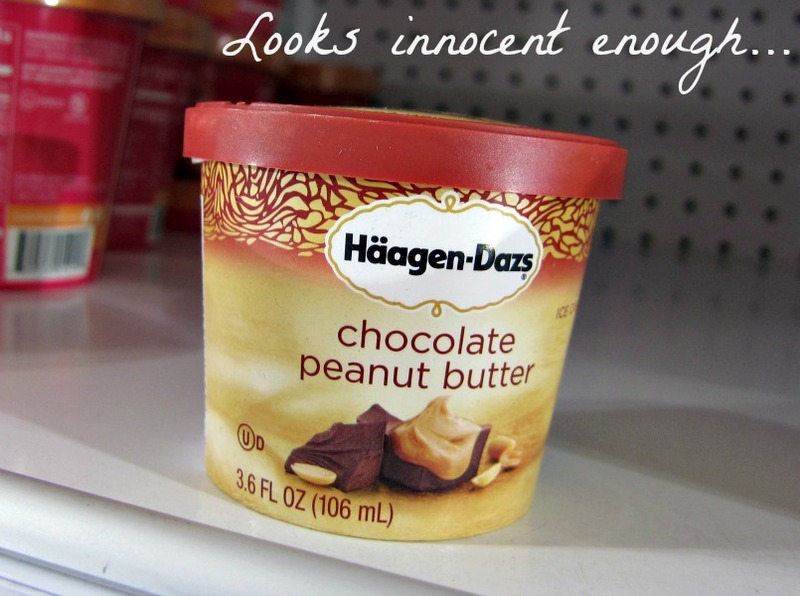 Peanut butter, almond butter, any nut butter – I love them all! But they are not created equal. JIF makes new pre-packaged peanut butter cups, at 250 calories a piece. They are perfect for traveling, dipping apple slices or banana, adding to oatmeal or just eating with a spoon. But they’re concoction is more than just peanuts and salt – sugar, molasses, and hydrogenated oils also make their way into the little cup. 310! Three Hundred and Ten Calories. I’m sorry, but that ice cream would be gone in 1.3 minutes and then I’d need to run about 3.5 miles to burn it off. NOT HAPPENING! Frozen Greek Yogurt – you can make your own! Pick a fat-free Greek Yogurt (usually 100 calories for 6 ounces) and add in some banana, dark chocolate chips, almonds, or all of the above. Freeze and enjoy. You just saved yourself 20 grams of fat. If you can’t get fresh fruit, don’t settle for sugar-loaded fruit cups. I saw some new “flavored” fruit cups and would like to have a serious conversation with whoever it was who had the idea to add caramel and brown sugar to simple fruit cups. No wonder kids are getting larger and larger! We are teaching them that to enjoy fruit, it must be covered with candy! Dehydrated fruit still contains a decent amount of nutritional value. Again, not all dried fruit is created equal! For instance banana chips are full of oil and sugar; freeze-dried banana is much lower calorie/fat/sugar, though I do admit it has a little bit of a “Styrofoam” texture… ;) My favorite freeze-dried fruit is strawberries – they are so tart! Dried and dehydrated fruits certainly shouldn’t replace fresh fruit all the time, but most do count as a serving of fruit. Blueberry muffins, Banana Bread, Carrot Cake, and Oatmeal Raison cookies do not! 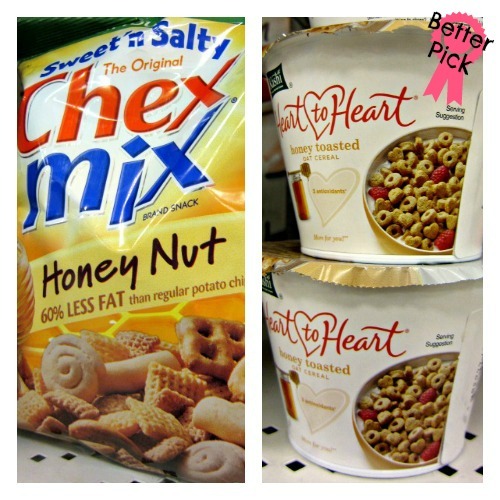 Chex Mix fill almost all vending machines, and the combination of textures and flavors plus the salty seasoning can be addicting. 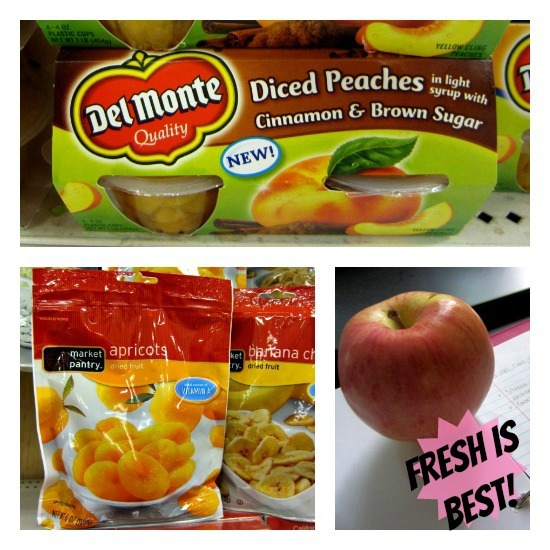 While the 130-calories per serving is not bad for a snack, the normal size packages contain 8 servings! Unless you measure out your 30 gram portion, you could end up eating much more than a simple serving. Kashi cereal cups are the perfect amount, and I think dry cereal is a good afternoon snack when you need something crunchy! They are lightly flavored with honey and shaped like cute little hearts. 140 calories and no temptation to eat more than a serving. It seems like every time I walk past the community kitchen, someone is making Mac n’ Cheese. (Either that or bacon…) I used to LOVE Kraft as a kid. But now the idea of cheese in powder form and the unnatural yellow kind of grosses me out. Besides the unnatural form of cheddar, this comfort food is loaded with sodium. One box is your entire day’s worth! Also from Kraft, a throw back from elementary school lunch boxes: String cheese! It’s pre-portioned, and now there are half a dozen different flavors. (where was the Sweet BBQ string cheese when I was 7?!) Pair it with an apple or some grapes for a complete snack! 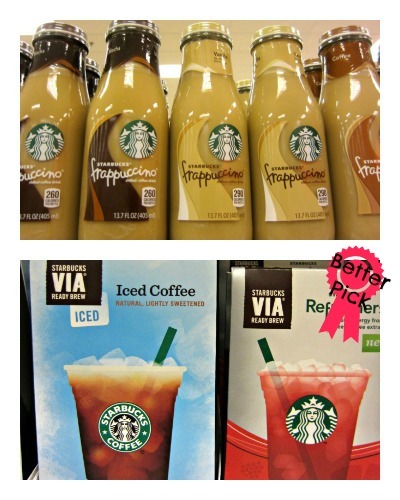 A few years ago, I would NEVER have turned down a Starbucks bottled Frappuccino. Any time I had a Target gift card from Christmas or something, I would buy a four-pack and mix & match all of the flavors to get one of each: vanilla, caramel, mocha, coffee. Those things were my favorite! But now I’m more conscious of sugar, fat, and calories. I’d rather make my own iced coffee. Starbucks has really improved in the healthy department over the last few years! They’re breakfast wraps, Skinny Lattes, and now VIA Iced Coffees are perfect for addicts like me. 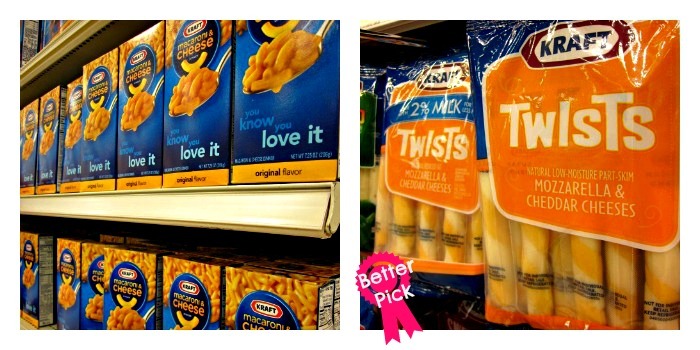 I actually have plenty more grocery swaps but this has turned into a pretty massive post, so I’ll save them for later. Have you tried “Clean Eating” & what was the hardest thing to give up? Posted on March 9, 2013, in Coffee, College, Dining Out, Healthy Habits and tagged fitness, grocery, health, snacks. Bookmark the permalink. 7 Comments. Yeah, I started eating “clean” after learning a lot of scary stuff about processed foods in my environmental science class. We do Meatless Mondays as a class and I’ve also cut most processed foods out of my diet. Some of my favorite natural brands are Choboni Greek yogurt, Paul Newman’s cereal, Kashi granola bars, and Archer Farms Blue Corn Organic tortilla chips (from Super Target). This is a fun post! I especially agree with you about the nut butters – they’re delicious enough on their own, without hydrogenated oils or sugar!